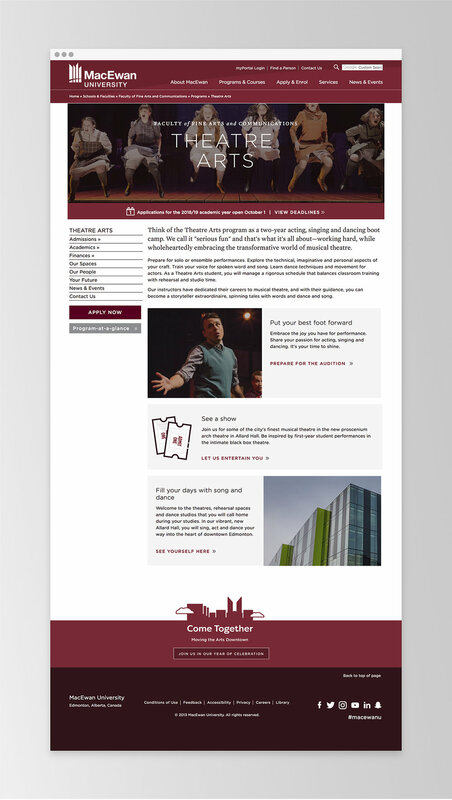 An ongoing project with MacEwan University, redesigning various segments on their website. The kick off project was redesigning the program pages within the Faculty of Fine Arts and Communications. The main goal of this project was to develop a new way to add content to the site. The previous model consisted of one block of content for each page with the ability to add small blocks to either side of the content, side blocks. This resulted in very narrow content pages due to these side blocks, we also found that during user testing students were not seeing the content inside the side blocks. They did not recognize it as important content, unfortunately the content was important and was being missed. Working with the web team, we developed a system we now call content blocks, the content runs the whole width of the page and we can add 8-10 blocks to one page. There are different styles for different kinds of content, which gives the content creator the ability to highlight certain pieces of information differently when needed. We also now have the ability to use the same content block across the whole site, so when the content changes in one block it will apply that change across the site. This is especially useful for global messages such as application deadlines or campus notices. The second phase of the redesign is to develop a responsive website. Currently the responsive redesign project is in development, through this first phase the web services team has been able to reformat and rewrite content in preparation to move to responsive. The previous MacEwan site template was three columns with a narrow block of text in the middle. There was not a lot of room to highlight an important message or to include a large image to represent the program. Content was also a crucial part of the redesign. Working with the content strategist and the web writer, we streamlined the page navigation and organization of the program pages, rewrote the introductory content, and created highlights on the landing page to promote different segments on the program site. The landing pages for programs are now more browsable and inviting, which has been proven in user testing to be easier to navigate than the previous site design.